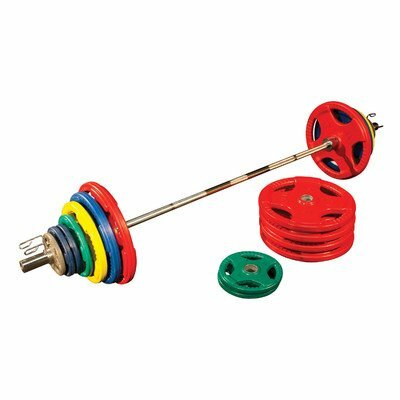 ORC500S Weight: 500 lbs Features: -Olympic set. -Comes with chrome bar. Product Type: -Olympic Weight Plates. Quantity: -Set. Weight Range: -60+ Lbs.. Material: -Rubber. Dimensions: Overall Height - Top to Bottom: -16". Overall Width - Side to Side: -84". Overall Depth - Front to Back: -16". Weight 300 lbs - Overall Product Weight: -300 lbs. Weight 400 lbs - Overall Product Weight: -400 lbs. Weight 500 lbs - Overall Product Weight: -500 lbs.